The fear, as expressed by former National Theatre director Nicholas Hytner and others, that filmed theatre would look like a lot of actors shouting seems to have abated. Indeed, nearly all the doubts and suspicions about this relatively new way of seeing shows – either by watching a one-off live performance streamed to your local cinema, or by digital download on your computer or laptop – have proved invalid. Far from putting people off the theatre, as many theatre practitioners feared, live cinematic performances would appear to be arousing valuable interest and excitement in the medium, as well as enabling those for whom a trip to London is not viable to see the best it has to offer. It also generates much-needed income for the producing venues, especially when shows are streamed live across the world. 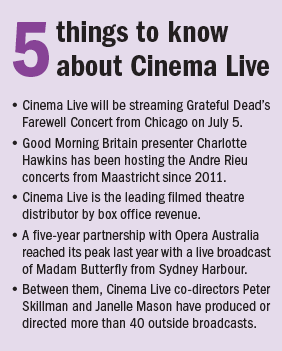 Cinema Live, which has offices in London and Sydney, distributes live theatre, music and operatic performances to cinemas in 70 countries, working in tandem with Digital Theatre. It is an offshoot of the Australian production company Shooting Star, which was established in 1992, and is one of several companies working in the sphere of live theatre streaming. 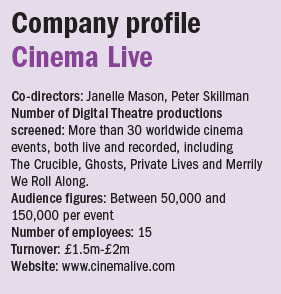 Event cinema, as Mason calls it, now accounts for 5% of the UK cinema box office, and has the potential to earn seven figure numbers for the originating producer. The strongest box office performers are the UK, Australia, Canada and, increasingly, Eastern Europe. Jones says the US is “tricky” because of the resources needed to promote a theatrical event across the States. “Our focus is London, but we’re open to streaming things from Broadway under the right circumstances,” she says. According to Mason, the determining factors as to whether or not a show puts bums on cinema seats are, firstly, star power – Richard Armitage proved a massive draw in The Crucible because it coincided with the release of The Hobbit in which he starred – and a well-known title. For example, War Horse, Lord of the Dance, Walking With Dinosaurs, Spamalot. 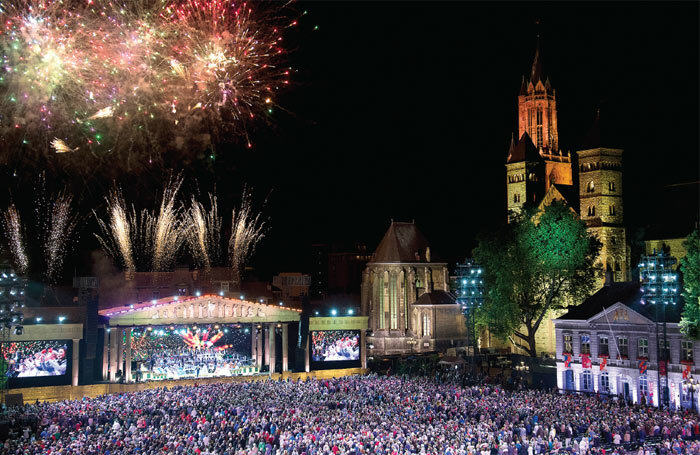 The most consistently successful live transmission since Cinema Live began six years ago has been the annual concerts in Maastricht given by Andre Rieu’s Strauss Orchestra, which has a massive following in Europe and Australia. Rieu employs his own technicians to film the concerts, and Cinema Live provides what they call the “wrap-around elements”, such as introductions, vox pops and an interview with Rieu. Clearly Cinema Live and others are excited about the future of live cinema streaming and digital downloads, but Mason believes it is still a work in progress.